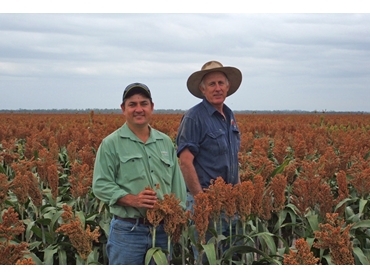 KLR Agriculture’s Ross Hutchinson is helping to meet the demand for feed rations in the vast feedlot regions of Central Queensland by growing 1,000 hectares of high-yielding grain sorghum variety Pacific MR43. Demand is high in these regions for feed rations that are nutrient dense and affordable. Mr Hutchinson farms Roxborough, situated along the Dawson River between Duaringa and Baralaba, with his wife Jenny and sons Logan and Kelly. He had a good yield in the summer just gone, and the prices were right for both the grower and the grazier. The farm managed four tonnes per hectare yield from the dryland area and seven tonnes per hectare from the irrigated paddock. With the strong prices making it a worthwhile season, the Hutchinsons sent most of the grain off to piggeries and feedlots in the Callide/Dawson and Burnett areas in July. The grain sorghum paddocks at Roxborough were split 70/30 dryland and irrigated when sowing began in early January to fit the weather patterns of the region. About 70% of their sorghum was grown dryland because it fit in with their dryland winter rotation of chickpeas. A fairly wet summer created some moisture trouble. About 300mm of rain fell across the season, with most of it coming early and drying up for the later crop. This was a good test for the Pacific MR43, which is usually grown for its drought tolerant traits. The crop was sown using an Excel disc opener on one-metre rows at a rate of 42,000 seeds per hectare. Applications included glyphosate pre-plant and atrazine post-plant, in addition to 300kg/ha of urea on the irrigated paddock. Looking toward this summer, Mr Hutchinson is considering the early crop, though he will still stick to his reliable rotation of chickpeas and sorghum.